This little cutie was colored with Copic markers in colors to coordinate with this AWESOME paper, which is a part of the new Peachy Picks Kit that will be completely revealed along with all of the stamps that are coming your way on November 5th. There's more peachy inspiration on The Peachy Keen Stamps Blog, so head on over there and check out what my group has got to share with you today, then check back tomorrow and Sunday for MORE amazing samples with the new stamps, and don't forget our BIG reveal and Release Party on The Peachy Keen Connection on Monday, November 5th at 6:00 p.m. Here's a link to our event on Facebook, so that you can let everyone know we'll see you there!! If this isn't enough excitement, then you're REALLY gonna go NUTS over this news!! 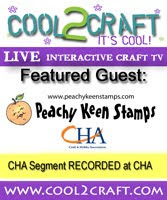 Have you seen that Peachy Keen Stamps is holding a call for their 2013 Design Team? Oh yeah, baby! We've got the call going through the month of November, so if you want to be a part of an AWESOME team with AWESOME benefits, send in your submission TODAY!! Here's a link to the information on our PKS BLOG, and SPLITCOASTSTAMPERS, where you'll find ALL the details! Have a GREAT week, friends! Thanks for stopping by and HAPPY STAMPING to ya! WOW! Lorie, this is just cute as can be. That elf is SO cute and you know how much you amaze me with your coloring skills! Gorgeous card! Love it. Great layers. Love the papers. Lorie - I LOVE this! Absolutely amazing! Your coloring is gorgeous as always! Lorie- Amazing! I LOVE this! Your coloring is gorgeous as always! Lori ~ OOOMMMGGG! Seriously this is BEYOND ADORABLE!!! Well you know I ADORE and LOVE your coloring and htis elf is just PERFECTION!! LOVE it!!!! This is NOT going to be good on my credit card!! How awesome is this Lorie?!?! I LOVE this adorable elf and your coloring....over the top!!! Looks like a this is going to be a GREAT new release!! Cutest Elf EVER! You are so talented!! What an darling card, Lorie! This Christmas elf is just adorable and, as usual, your coloring is so fantastic it appears he's going to jump right off the card! Beautiful, beautiful card! WOW AMAZING. Your card is just so BEAUTIFUL. Love it. This is so cute, Lorie! Love your coloring! And that image is darling!!! Lorie--this card is so darn cute and that little guy just makes me smile. Wonderful Colors! Wow, what a cutie! Love your coloring and the "candy" striped ribbon is perfect! CA-UTE!! love how you did the ribbons in the corners! Adorable! Looks like this card is right out of a catalog. You color like a rock star!! !